Info on chipping Location, identifying, etc. 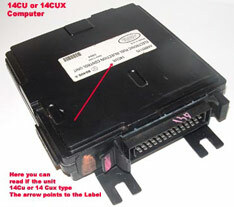 This label, located on the ECU top-cover will indicate 'part no' and 'date' info, please make sure your is 14CUX type and Not 14CU. It is not possible to chip the '14CU' variant. Fortunately however this type is not common on Morgans except NAS models. All Done !!!. This ECU had already been re-chipped, (lower left) & has a yellow sticker on the top, it is shown plugged into our scrambler (Supplied). 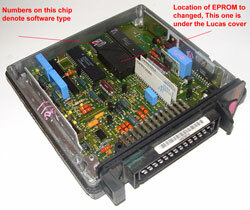 Both intern are plugged into the ECU's Eprom socket. 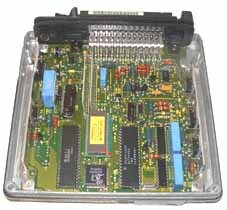 This ECU (bottom right) points out the Lucas cover over the original Chip and also identifies the chip that you need to read the part number from ( see below) this ECU type is easily chipped yourself as all types with this Lucas cover are already socketed. This close up, (below) shows the plastic Lucas cover hiding the chip, this at least denotes that your ECU is already socketed. 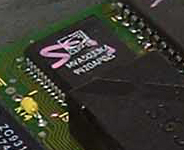 The top arrow is pointing to the chip that denotes the software variant within it's part number. (see below) This type is 'Plug & Play'. This is the (now) rare alternative often found on early Morgan models, You can see there is no black plastic Lucas cover, as the Eprom (the one with the white sticker) is clearly visible & is soldered directly into the main board. This type will best be sent in for socketing. It is still quite simple, read the part number, on the top of thew chip If it has the letters 'KA' this indicates the later variant (X36) software, Otherwise and with any other numbers it is for sure the earlier type (X22) software. You need not worry about the differences, but do we need to know what variant you have to supply you the correct replacement chip.